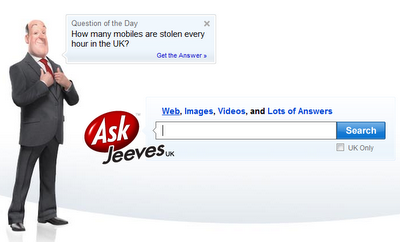 I followed the Ask Jeeves Twitter account back during the search engine's second, third, or perhaps eighth return. Never really managed to get into any promotional banter with the account... shame. It's not unusual for Mr Jeeves to use Twitter to ask questions. After all; that's the search engine's thang. You ask a question and it'll answer it. I was surprised to see the butler offer a direction though. 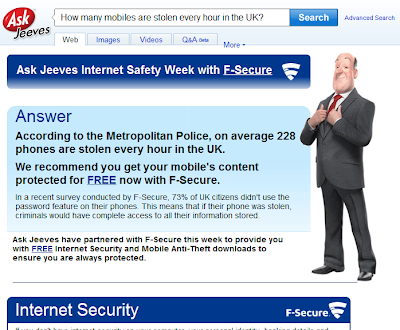 If I wanted protection I should visit this link. It was all bit.ly'd, of course. 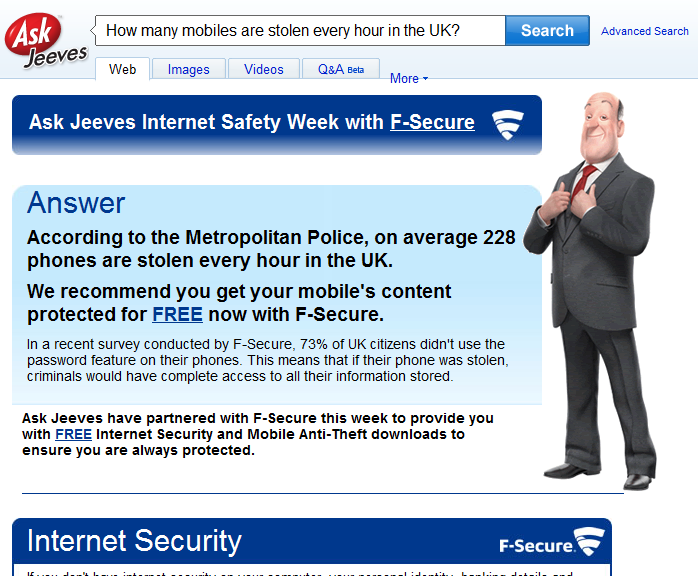 Looks pretty clear to me that Ask has an ad deal with F-Secure. Nothing wrong with having an ad deal. Just didn't expect Ask to be tweeting about it. Just a little bit digging also shows that today's question also appears on the search engine's homepage and link straight through to the the specially created landing page too. Doesn't do much in the way of showing me Ask's ability to answer the questions I ask. Oh well. Times are tough. There's nothing wrong in Ask mixing in a little ads into the search profile and I'm fairly sure not no one's going to mistake this for a search result! However, I wonder what brand concerns they had around this tactic.